That’s my great uncle, Jack Nixon, staring out at us from the pile of photos above. Jack was the second eldest of five boys who all served their King and country during the First World War. Four of the brothers served in the British Army whilst Edgar, the oldest brother, served in the Royal Flying Corps (and later, the RAF). Four of the brothers came home but Jack was killed in action on 3rd October 1918, a little over five weeks before the war ended. Apart from Edgar, whose service record survives in the undamaged AIR 79 series, Jack is the only brother for whom an army record survives. The records of his brothers Sid, Alf and my grandfather, Walter, were all presumably lost in 1940 when the Luftwaffe bombed the warehouse in Arnside Street in London’s docklands where First World War soldiers’ records were being stored. Jack’s papers shows signs of both fire and water damage but the majority of the text is still legible. Among these papers in series WO 363 (also known as “the burnt documents”) is a very useful army form which is only found in the records of deceased servicemen. The form in question is Army Form W.5080 and it was initiated in 1919. A code at the bottom of the form indicates that the initial print run was for one million copies; sobering indeed when you remember that each one was to be used to record the names, ages and addresses of relatives of deceased soldiers. The form was sent to the soldier’s next of kin and, as poignant as it is, it is also an extremely useful document for today’s family historian. 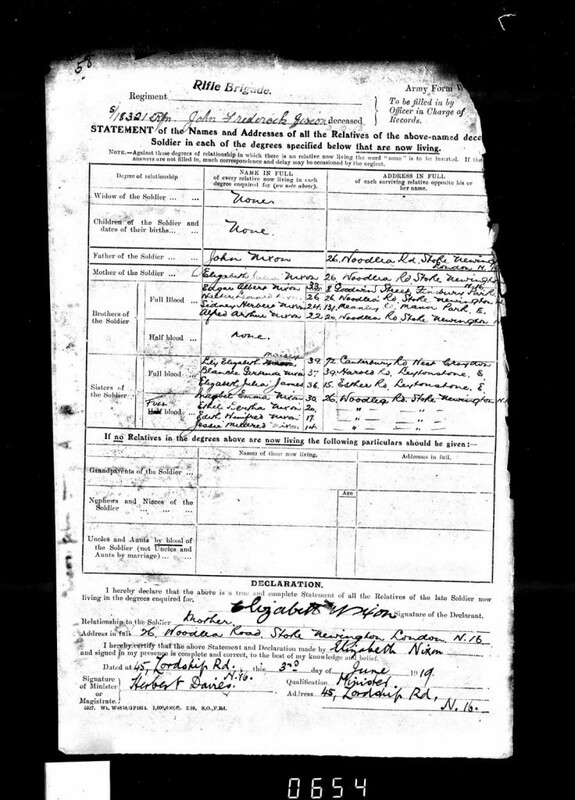 Here, on Jack’s form, we see the names and addresses of his parents, four brothers and seven sisters. My great grandparents and six of their children were living at 26 Woodlea Road in Stoke Newington, North London (the same address where my father would grow up and which his parents would call home until they moved down to Dorset in the 1960s). Keeping track of female ancestors can often be a problem for family historians. There they are one minute on a nineteenth century census return, but gone on subsequent returns, their last name having changed as a result of marriage. Here, on Army Form W.5080, it’s not just the household we’re getting but the surviving parents, spouse, children, siblings and half-siblings, whatever they’re called and wherever they happen to be living. As I wrote recently on one of my blogs, the form is gold-dust for researchers. I just wish it hadn’t been necessary to complete this particular form for Jack. More about Paul: Paul Nixon has been researching British military history for nearly 35 years (and he’s not finished yet). As well as working in the licensing team at Findmypast, he also publishes a number of military blogs including one on Army Service Numbers 1881-1918, British Army Medals and a remembrance blog for the dead of the First World War: WW1 Remembrance.